Commercial property investors, and their unique cousin, the developer, often get to (or start at) a point where real estate investment halts without the infusion of additional risk capital. It’s that dynamic, at least partially, which creates the market that we serve. Typically, we do so by engaging on single projects with qualified operators to recruit a joint venture equity partner. We get them the capital they need, and their business continues to thrive. The work it takes to recruit capital always proves challenging. True, we’re not working in the sun for 10 hours a day, six days a week laying brick. But even the best laid investment thesis is not too easily sold, then closed, so that a project can get moving. 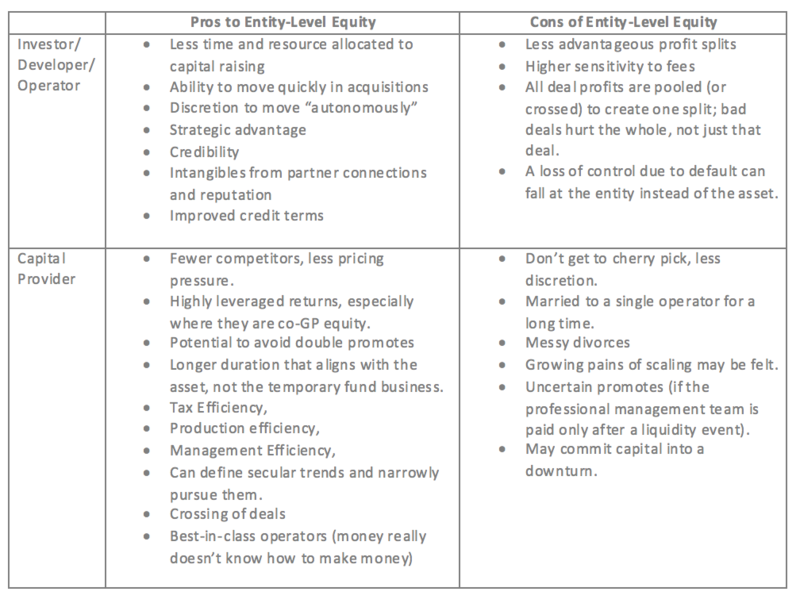 Equity, (in contrast to debt) takes on almost all of the risk inherent in a business plan and, as such, needs to understand and structure the investment to mitigate risks and earn an appropriate risk-adjusted return. Because of that, the funding of each deal, for advisor, investor, and operator alike is a major undertaking that requires an enormous amount of effort and attention to detail to successfully conclude. Doing it over and over, well, can be exhausting. Once you’re doing more than 2 or 3 of these a year, a large portion of enterprise resource gets consumed by this fundraising process. Enter the need (and opportunity) for entity-level funding. 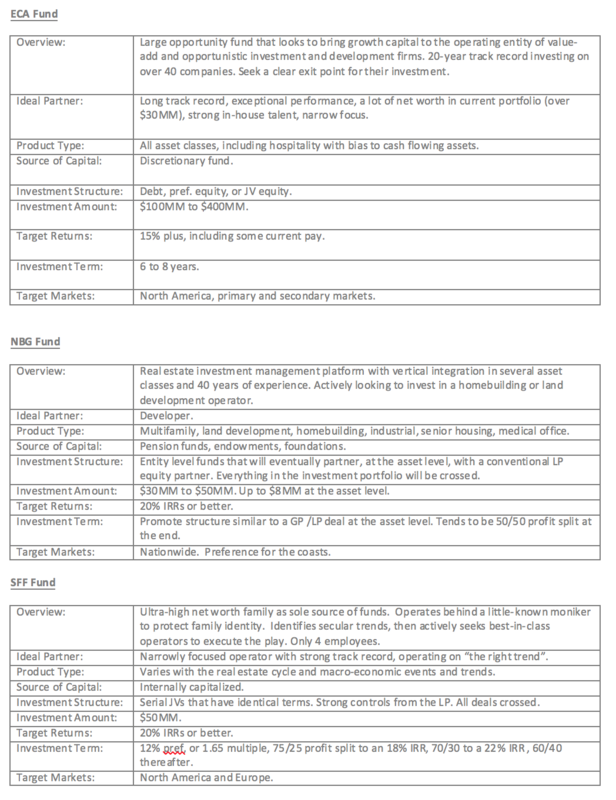 This often-sought “holy grail” (it’s just that rare) removes the efforts associated with serially funding unique deals, each with their own risk profile, investor(s), and structure that aims to balances the risks and rewards of both investor and operator. Instead, an investor underwrites the target market(s), projected business plan(s), and the operator, then gives the operator discretion to deploy capital in pursuit of that plan. This frees the enterprise from much of the friction associated with one-off capital raises. Importantly, this unfolds only in the “major leagues”. I hear frequent refrains of “if I could just get someone to put $10MM behind our firm, we’d make a mint.” While that may be true, if the statement comes from an operator who can’t demonstrate his past successes, and net worth and liquidity due to those past successes, he won’t be able to secure the attractive debt financing necessary to make the deal happen. There are simply better options for investors than supporting that risk profile. With that backdrop, looking at the pros and cons for both side of this exchange proves instructive. 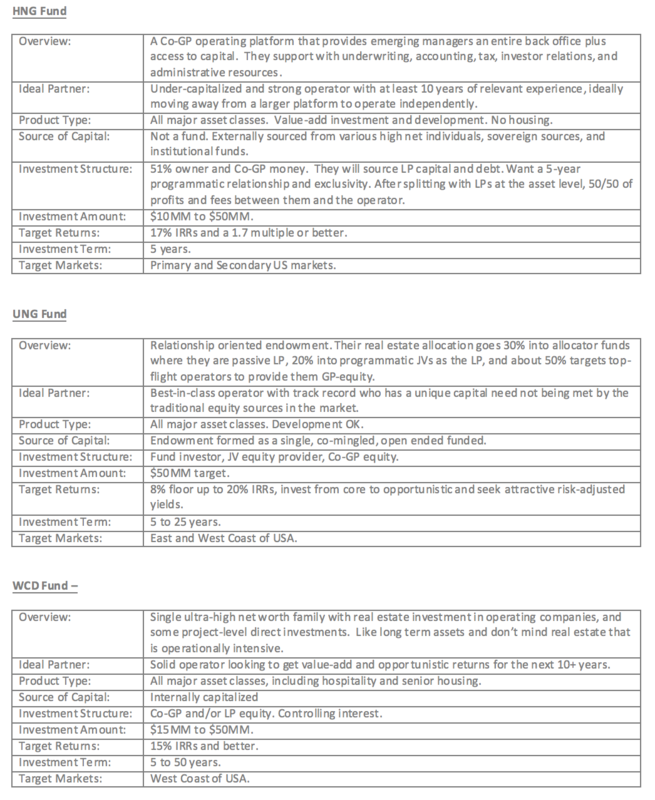 While this type of equity investment isn’t how we typically work the capital stack, if you fit the model above and would like to explore this kind of capital partner, we’d welcome speaking with you in further detail.